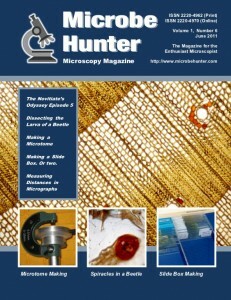 Welcome to the 6th issue of MicrobeHunter magazine. You can download the PDF and order a printed version. In this episode, Joseph Wilhelm continues to build a Zeiss GFL compound and Spencer stereo microscope. Sometimes things are not as they appear. In this case we have a look at a suspected parasitic infection of a larvae, which turned out to be something quite different. Here we have a look at the construction of a microtome by modifying a micrometer screw gauge. Making a no-nonsense Slide Box. Or two. Plain and Simple. Why buy a slide box when it is so easy to make one yourself? A little corrugated cardboard and wood will do the trick. The free program GIMP provides tools that can be used to determine the pixel distance between two points. This information can then be used to calibrate the system to be able to measure the size of structures in micrometers.